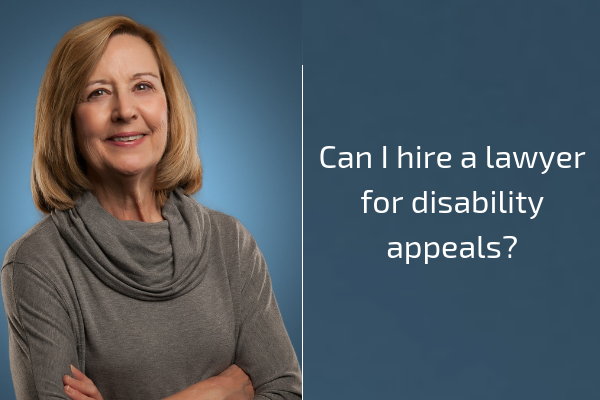 Can I hire a lawyer for disability appeals? Hi, I am Sharon Christie, your nurse attorney for Social Security Disability Benefits. If you have previously filed a disability application and been denied and probably didn’t do anything else about it, because I hear that a lot from our clients. I applied a couple of years ago I got denied, I was so frustrated I never did anything else, and then they will come to us call us and say can I start a new case? Absolutely you can, the fact that you have already filed an application and the case has been closed will not prevent you from filing a new case. So you can absolutely file a new case and this time hire a lawyer to help you with that case. The same thing is true if you decide to file an application on your own and then you get denied, and you want to appeal it but you don’t want to do it by yourself. You can hire a lawyer at that point. You just have to make sure if you have been denied that you call a lawyer right away because you only have 60 days to file that appeal. Sharon Christie is the owner and founder of Sharon Christie Law, and is an attorney and former nurse. Her team of professionals and paraprofessionals help people win Social Security Disability Benefits! Our Social Security Disability Law Firm serves clients in Maryland, Southern Pennsylvania, Northern Virginia, and Washington DC.